This past weekend I went to New Orleans to take part in the Bouchercon World Mystery Convention, which consists of hordes of writers and readers coming together to talk about mysteries. This was my first time at Bouchercon and my first time in New Orleans and I am bubbling over with all the wonderful experiences I had. Here, in no particular order, are 10 of the best. 1. Drinking a Bulleit Old-Fashioned. It was pink and frothy and I won’t say it was strong, but I didn’t have anything else to drink for the next three days and I was perfectly happy. 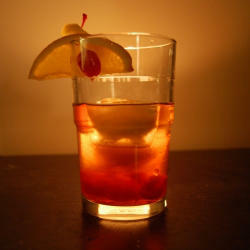 (Here’s a recipe, if you want to make one: https://www.bulleit.com/whiskey-drinks/frontier-old-fashioned/) 2. Seeing the Mississippi River. I’m sure I have seen it before over the long course of my life (perhaps when I was on the Lewis and Clark expedition). But I haven’t seen it lately, and when you look at it it’s hard not to be moved by the important role it’s played in our country’s history. 3. Talking to private detective and author Ben Keller, who gave me many fabulous suggestions for how to make Maggie Dove a better detective. I won’t share them now. You’ll have to read the book! 4. Being on a panel. My panel was titled, Endless Harmony, and it took place at 9:00 on Saturday morning. Of course I spent all Friday night agonizing, but when I actually got there, it was so much fun. Cathy Pickens was the moderator, and fellow cozy writers Kathi Daley, Sherry Harris, Sara Rosett and Julie Anne Lindsey were on the panel. Dru Ann Love was our time-keeper. Afterwards someone told me it looked like we were all great friends, and it felt that way too. 5. Walking around the French Quarter, which is just as beautiful as in the movies. 6. Going to the Sisters-in-Crime breakfast and hearing about all the wonderful things they have planned. They are a great resource for all mystery writers. 7. Going to the book bazaar. This was a huge room filled with books and everyone who attended Bouchercon got tickets that allowed them to pick out 6 or 8 (I forget) free books. I’m happy to report that there were bound copies of Maggie Dove there and they were all taken (and not just by me!) 8. Eating. So much good food. Praline bread pudding and beignets covered in confectioner’s sugar. And that was just breakfast. 9. Attending a dinner for Random House authors at Brennan’s restaurant. That had to be a career high, especially when I walked into the room and saw Lee Child and shook his hand. 10. Meeting the Miss Demeanors in person. (Okay, I saved the best for last). What a joy it was to meet everyone. (Or almost everyone, because Alexia is in Ireland, doing research.) We had great meals, we talked, we planned, we chatted with our fabulous agent, Paula Munier, who worked the whole time lining up opportunities for us. It was magical. 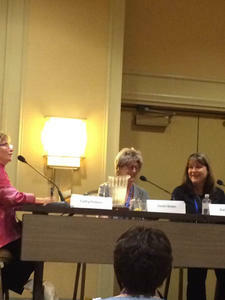 So that was Bouchercon, or some of it. Next year, Toronto!